When summer arrives, so does a great amount of fruit. Our minds often turn to transforming the fruit into a dessert, be it a pie, ice cream, crisp, or some other sweet treat. While I like some sweetness, I also like some contrast in my foods. That’s where this recipe comes in handy. It provides the freshly picked sweetness of peaches balanced with the tangy bite of vinegar. Although it’s not a combination I’d tried prior to creating this recipe, it’s one that was an instant hit. Serve them as is, on top of some cottage cheese, or as a salad ingredient. You’ll be sure to enjoy them. To learn more about this recipe, originally published in August 2016, keep reading. Pickles are a popular snack in our house. At a bare minimum we always have a jar of kosher dill pickles in the fridge. However, we also usually have an assortment of other veggies: beets, carrots, onions. My husband and I have spent a number of fall weekends making our own pickled veggies but also are willing to purchase store-bought when our schedules are busy and the pantry is empty. Our pickle consumption definitely increases in the summer. There’s something about a cold veggie full of flavor that really rounds out a meal. Whether it’s simply a slice or two of pickle to top a burger or some pickled zucchini served with grilled pork chops, I like the acidic bite these veggies add. I had to do a quick search to make sure the heat of summer hadn’t gotten to my brain. 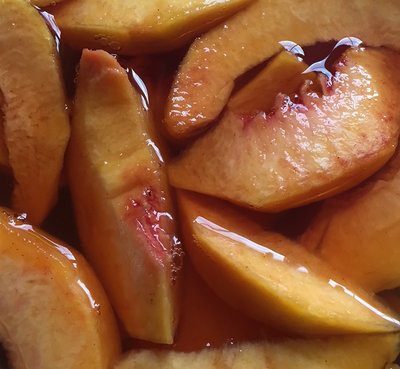 Do people actually pickle peaches? The answer is yes, so I had a variety of recipes to review before deciding what I wanted mine to taste like. My final product was this delightfully tangy, sweet, and savory side. They were easy to make and quickly disappeared. I think this quick pickle recipe will be used regularly during the heat of summer. Combine vinegar, water, sugar, salt, cinnamon, and cloves in a medium sized pot over medium-high heat. Place peaches in a bowl and top with vinegar mixture.